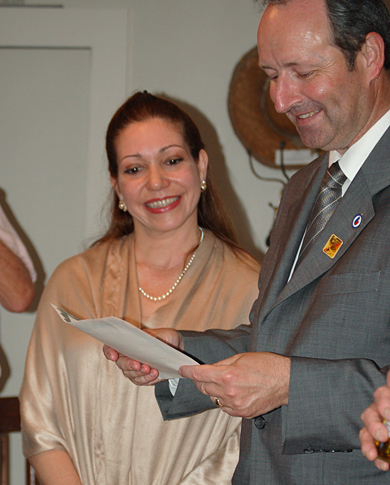 On September 10, 2007 at 4:00 p.m. the Acadian Museum hosted and honored Comte Gilbert de Pusy La Fayette, as a “Living Legend.” Comte La Fayette is the direct descendant of the Marquis de La Fayette. On September 6th the Marquis de La Fayette’s 250th birthday was celebrated. Last week, the U. S. Senate approved a resolution honoring the City of Lafayette for its year-long celebration of the heroic French nobleman’s life and Acadiana’s rich French heritage. Following the visit to the museum, Warren Perrin, President of CODOFIL brought La Fayette for a tour of the areas adversely affected by Hurricane Rita and the ongoing recovery efforts in Henry, Louisiana. While at the Acadian Museum, the Count toured the current exhibit: “The Overlooked Legacy of La Fayette: The Louisiana Purchase,” which examines the role that the Marquis played in bringing about the Louisiana Purchase which more than doubled the size of the United States. While the exact borders of the Louisiana Territory have never been entirely certain, approximately 827,987 changed hands when France sold the land to the United States for the sum of fifteen million dollars. The Purchase encompassed roughly the land stretching west from the Mississippi River to the Rockies. New Orleans was included, but not the land that became Texas, southwest Louisiana or the “Floridas” to the east. Warren A. Perrin, President of CODOFIL making his presentation to the Marquis de La Fayette - Comte Gilbert de Pusy La Fayette. The men who were responsible for this outsized land deal, Thomas Jefferson and Napoleon Bonaparte, were themselves larger-than-life personalities. However, often overlooked and unappreciated is the important role that the Marquis de La Fayette played in bringing about this memorable event. This exhibition shows how La Fayette’s close, lifelong friend, Thomas Jefferson, encouraged him to set sail to the aid of the American revolutionaries. This involvement, undoubtably, made the revolution successful and ensured the enactment of the Louisiana Purchase in 1803, a time when France and the United States, sister Republics, had survived the agony and triumph of revolution. Comte Gilbert de Pusy La Fayette with his wife Irasema de Pusy La Fayette receives his honor. The Living Legends series, free and open to the public, is recognizing and honoring those individuals who have helped shape and define our Cajun culture. 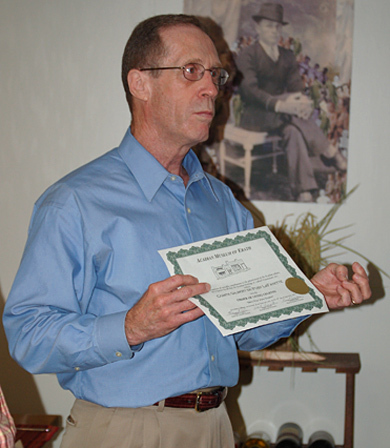 The program is sponsored by the Acadian Museum of Erath (acadianmuseum.com), a nonprofit organization.